Rugeley Snooker Club, formerly Rugeley Billiards Club is a long established private club, run by members for its members. The club has a relaxed and friendly atmosphere and is available for all of it's full members 24 hours a day, 7 days a week, 365 days a year. We provide a licenced, well stocked bar on weekdays between 8:00pm and 11:00 pm, for our members use. 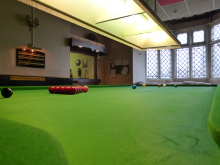 Rugeley Snooker Club is run by committee and trustees, so every important decision is made by a group of people rather than just one, meaning that decisions are always made in the interest of the club and its members. There will always be a committee member available in the bar during opening hours, and members are encouraged to discuss any matters or ideas with us. The committee and trustees meet on a monthly basis to discuss these matters. If you are interested in the competitive aspect of snooker, the club also has teams that compete in the local leagues. Please contact a committee member for details.